▲ Participants are listening to President Han Tae-sik (Bogwang)'s opening statement. 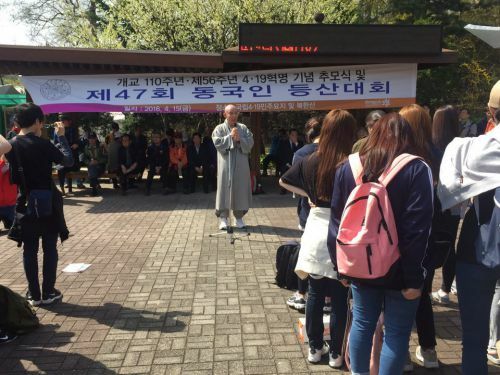 On April 15th, 2016, faculty, students, and the vanguards of April 19 Revolution attended the 47th Donggukians’ Climbing Track which is an annual event to cherish victims of April 19 Revolution. This event started with the opening statement of President Han Tae-sik (Bogwang), Jo Seung-woo, the vice chairperson of the GSC, and Oh Jin-mo, the president of the 4.19 men of merit comrade party, at 4.19 National Cemetery. They commemorated the Donggukians who sacrificed during the April 19 Revolution and maintained that participating in climbing is also considered as an act of paying a tribute to the victims. Then participants including students, professors, and vanguard of April 19 Revolution started to climb Bukhan Mountain along Daedong-moon course.